The Ace of Cups shows a chalice overflowing with five streams of water. The cup represents the vessel of your subconscious mind; the five streams are your five senses and the abundant emotion and intuition flowing from within you. The hand holding the cup is sliding out of the clouds, a symbol of your awareness of spiritual energy and influence. Below the hand is a vast sea covered with lotus blossoms, signifying the awakening of the human spirit. A dove descends towards the cup – a symbol of Divine love flowing through the subconscious mind to conscious awareness. With the Ace of Cups, Divine love and compassion are pouring through you. You are a vessel for deep, spiritual love from the Universe, and you can’t help but let that love flow through you and into the world. You receive love, you give love, you ARE love. Your heart overflows. Now is the perfect time for you to open your heart and experience the rich flow of emotion available to you right now. You are more receptive to creative opportunities, loving connections, and deep compassion for other living beings. As with all Aces in the Tarot, this card comes as an invitation. Will you take it? Will you say “Yes!” to Divine love and compassion, and will you run with it? The Ace of Cups carries the potential for spiritual and emotional fulfilment – but only if you embrace it with an open heart. This card often appears in Tarot readings when you are open to creative expression, especially when you can allow your emotions to shine through your endeavours. You may be inspired to start a new project, take an art class or even engage in interpretative dance. At this point in your life, you are comfortable with who you are and happily express this part of yourself to others. You see fresh potential in allowing your creative juices to flow. Let your imagination and talent unfurl to new possibilities. The Ace of Cups often represents a new relationship, be it a friendship, a new family connection or blossoming romance. It is exciting – fluttery even – and you are so glad to have met someone with whom you can share a special connection. Give yourself permission to open yourself to giving and receiving unconditional love, and you will notice that affection flows effortlessly when you are in this loving state of mind. 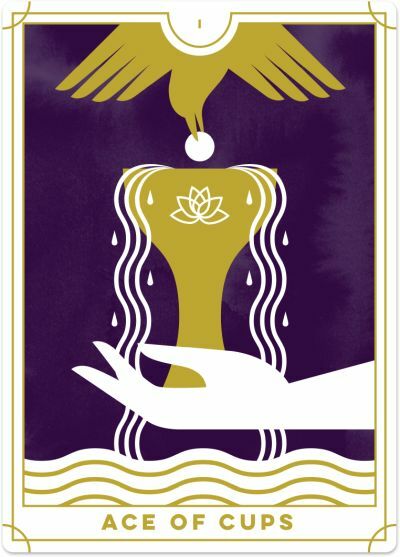 The water in the card reflects the flow of emotion, and thus, the Ace of Cups suggests that the enthusiasm you two generate will get you fired up about yourself and life. There is a generous, compassionate side to the Ace of Cups, too. See this as a time of giving (not taking) and make the most of any opportunity to help others. You have the power to share your inner radiance and positive energy, bringing great happiness to those around you. And you will find that the more you give, the more you receive on multiple levels. Finally, the Ace of Cups can signify conception, pregnancy or birth. Look to the other cards in the reading for further confirmation, such as the Empress, Page of Cups or Four of Wands. On a more metaphorical level, it may mean the birth of a new idea or a spark of inspiration – something in which you can invest a great deal of loving and creative energy. Yes, this is the self-love card of the Tarot deck! In the upright position, the Ace of Cups is about love for all things. In the reversed position, it speaks to love for oneself. So, before you send your love out to the world, send love to yourself, filling up every cell in your body with Divine love and happiness. And the more you do this, the more you can exist in flow with life itself. The reversed Ace of Cups is a sign that you are in connection with your subconscious mind and attuned to your intuition. You are exploring this part of yourself privately right now, and discovering how you can bring more intuition and flow into your life. On the flipside, the Ace of Cups reversed may be a sign that you are repressing your emotions, not wanting to express yourself fully to the outside world. You have your reasons for keeping your feelings close and not wanting others to know what’s going on inside. You may feel embarrassed or afraid of what might happen if you were to express your emotions. You may worry that if you allow your feelings to flow, they might turn into an overwhelming flood that can’t be switched off. However, be careful that you do not create an internal blockage by repressing how you feel. If you are not ready to share your emotions – that's okay! You can find ways to release them privately, through journaling, creative projects, movement, or screaming your frustration and anger out in the car. In a relationship reading, the reversed Ace of Cups can show that you are withholding your emotions for fear of getting hurt. You know that you must trust in your partner for the relationship to move forward, but, for the time being, you are holding back.